• THE SPEAKER DOESN’T NEED TO SAY WHO OR WHAT DOES/DID SOMETHING BECAUSE IF IS OBVIOUS FROM THE SITUATION/CONTEXT: THE LAW WAS PASSED EALIER THIS YEAR (OBVIOUSLY BY PARLIAMENT). • WHAT HAPPENS IS MORE IMPORTANT THAN WHO DOES IT: THE CAR HAS BEEN REPAIRED. • WHEN WRITING IN A FORMAL STYLE: YOUR TICKET HAS BEEN BOOKED AND CAN BE COLLECTED AT THE OFFICE. • ONLY USE GET WHEN SOMETHING HAPPENS OR CHANGES: HE GOT ARRESTED B Y THE POLICE. THE QUEEN IS THOUGHT TO BE RECOVERING FROM A HEAVY COLD. FERNANDO ALONSO IS CONSIDERED TO BE THE BEST SPANISH FORMULA ONE DRIVER OF ALL TIME. LIONS ARE KNOWN TO HUNT IN THIS AREA. ELENA IS THOUGHT TO BE CLEVER. VERBS THAT CAN BE USED WITH THIS PATTERN ARE: CONSIDER, EXPECT, FEEL, KNOW, SAY, THINK AND UNDERSTAND. IT IS CONSIDERED RUDE TO INTERRUPT PEOPLE WHEN THRY ARE TALKING. VERBS THAT CAN BE USED WITH THIS PATTERN ARE AGREE, DECIDE, HOPE, PLAN AND PROPOSE. IT IS KNOWN THAT LIONS HUNT IN THIS AREA. IT IS THOUGHT THAT ELENA IS CLEVER. ADEPT (ADJ) GOOD AT DOING SOMETHING DIFFICULT. ATTENTION SPAN (N) THE LENGTH OF TIME THAT YOU CAN KEEP YOUR THOUGHTS FIXED ON SOMETHING. BE GLUED TO SOMETHING (VP) TO BE WATCHING SOMETHING ESPECIALLY A SCREEN, WITH ALL YOUR ATTENTIOM. BE WELL ON THE WAY TO + V-ING (PP) TO BE MAKING GOOD PROGRESS TOWARDS A PARTICULAR GOAL. CATCH YOUR EYE (VP) YOU NOTICE SOMETHING BECAUSE IT IS ATTRACTIVE, INTERESTING OR UNUSUAL. COME TO TERMS WITH SOMETHING (VP) TO ACCEPT AND DEAL WITH A DIFFICULT SITUATION. DEAL WITH SOMETHING (V) TO TAKE ACTION IN ORDER TO ACHIEVE SOMETHING. DISCRIMINATE (V) TO NOTICE AND OR ACT ON A DIFFERENCE BETWEEN TWO OR MORE THINGS. EXCHANGE IDEAS (VP) TELLING EACH OTHER YOUR IDEAS. EXERT CONTROL OVER SOMETHING/BODY (VP) TO USE CONTROL IN ORDER TO MAKE SOMEONE DO SOMETHING. EXPRESS AN IDEA (VP) TO SAY OR WRITE AN IDEA. FIGHT A LOSING BATTLE (VP) TO TRY HARD TO DO SOMETHING WHEN THERE IS NO CHANCE THAT YOU WILL SUCCEED. HAVE AN APTITUDE FOR SOMETHING (VP) TO HAVE A NATURAL SKILL OR ABILITY TO DO SOMETHING WELL. HAVE A FLAIR FOR SOMETHING (VP) TO HAVE A NATURAL ABILITY TO DO SOMETHING WELL. A LNK BETWEEN SOMETHING AND SOMETHING (NP) A RELATIONSHIP OR CONNECTION BETWEEN TWO THINGS. MAKE AN EFFORT TO DO SOMETHING (VP) TO TRY TO DO SOMETHING PUTTING ENERGY AND TIME INTO IT. MINDLESS VIOLENCE (ADJ+N) VIOLENCE THAT HAS NO PURPOSE. REPRESENNTATIVE (N) SOMEONE WHO SPEAKS OR DOES SOMETHING OFFICIALLY ON BEHALF OF ANOTHER PERSON. SHOP ONLINE (VP) TO BUY THINGS FROM AN INTERNET WEBSITE. SOLVE A PROBLEM (VP) TO FIND AN ANSWER TO A PROBLEM. 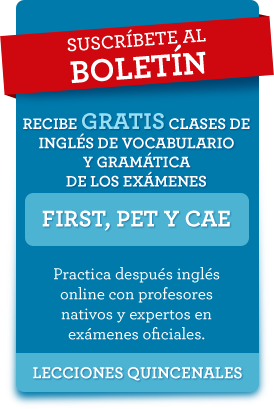 Esta entrada fue publicada en Clases de inglés gratis, Lecciones ADVANCED gratis el 30 diciembre, 2013 por admin.